In my role as graphic designer for Johns Hopkins All Children’s Hospital, I’m fortunate to work for an organization with a mission that’s kind of tough not to get behind – the care and treatment of children and support for their families. While my primary role is in graphic design, our department allows us the freedom to explore and utilize our other talents. It was such freedom that allowed me and our videographer Juan to brainstorm an idea to create a partnership video with the Tampa Bay Rowdies for Childhood Cancer Awareness Month. Juan is super-talented and had a basic framework in place. I came in with Indiana Jones. My idea was to utilize the spirit of that scene with our patient Vance facing off against one of the Rowdies’ players, which turned out to be Juan Guerra. Our department was on board and allowed us total creative freedom. The only catch? We had to concept, storyboard, write the script, film and edit in two weeks. Easy peasy. As you can see in the video above, our team came through. This was shown at a late summer Rowdies match and led to a nice chunk of money donated to the hospital. I was thrilled to work with Juan on this project and thankful for the help of our marketing team and the clinical staff at the hospital for volunteering their time. Of course, the video doesn’t work without the Rowdies’ players, Guerra, Georgi Hristov and Keith Savage. While I don’t necessarily recommend pitching a video idea about kids with cancer with Indiana Jones blowing away a bad guy, having a pop culture mindset does come in handy every now and then. It goes nowhere without a lot of other people on board lending their talents and it made me excited and proud to be a part of Kicking Cancer with the Tampa Bay Rowdies. Some episodes speak for themselves. This one doesn’t. At the So Bad It’s… podcast, we sometimes like to just hit record and see what happens. This is one of those times. On this SoBadBit, Jon asks Pete who his favorite president is and we go from there to Gary Coleman, the Brady Bunch and of course Davy Jones. Be sure to follow us on Twitter, where we are never not random in our tweets. Short, sweet and scientifically proven funny. That’s the idea behind our new episode vignettes, a little something we’re calling So Bad It’s Bits, or just So Bad Bits. Our first So Bad Bit is called Monkey Gotta Make a Dollar. Why? If you give us five minutes of your time, you’ll find out. Come on, you know you’re interested now. Don’t forget to follow us on Twitter, where we don’t make a dollar, but we do tweet for free. And for fun. Mostly for free. On this incredible episode of the So Bad It’s… podcast, we are joined by Bernie Gonzalez, host of the Fan2Fan Podcast, to discuss the television version of the Incredible Hulk. Specifically, we delve into a pair of episodes that encapsulate all that was good – and hysterically bad – about this hit (it lasted 5 seasons) series. ‘The Final Round’ captures the budding romance between David Banner (Benson) and Rocky (played by favorite So Bad It’s… thespian, Mr. Martin Kove), as a loveable lug boxer who comes to Banner’s aid while jogging through the dangerous streets of Wilmington, Delaware. Emotions and passions run high as Rocky gets David a job at his local gym where heroin and haymakers are in equal supply. In ‘Times Square Terror’ Banner makes the totally logical move to Manhattan to work in an arcade slinging quarters as one does when trying to cure oneself of a horrible anger-induced metamorphosis into a giant green monster. Before change machines could render his job obsolete, Banner eavesdrops on some mob-related shenanigans orchestrated by a mob boss named…Jason. This leads to a traffic-caused hulkout in a taxi and Lou Ferrigno running through Times Square/a back lot with cute green booties on. Classic Ferrigs! Don’t forget to follow us on Twitter, where we rarely hulk out, but when we do, we do it in the gentlest possible way. Such were the sound effects emanating from basements everywhere, courtesy of the mouths of many an 80’s kid as we enjoyed endless hours playing with those little green men of our youth, army men. Army men may not be de rigeur these days, and that’s certainly understandable, but for generations of kids – mostly boys – our collection of army men allowed some really creative world-building. Anyone who ever owned a bag or box of these 3-inch figures will instantly remember the handful of universal figures and their poses: The rifleman, the mortar guy, the bazooka guy, the flame thrower, the minesweeper, the ‘captain’ with a pistol and binoculars, the radioman, the soldier crawling on his stomach and the soldier hoisting a bayonet over his head. Sure there were a few others, but these were the A-listers. The A-Team, if you will. On this episode of our So Bad It’s… podcast, we talk the little green men, reminisce about introducing ‘guest stars’ such as dinosaurs and Star Wars figures and break out our favorite sound effects from when we were kids. It’s in no way embarrassing. Don’t forget to follow us on Twitter, where we often break out our favorite army man poses. There used to be a time when you had to get creative to get your hands on some ice cream. None of this tweet at the Good Humor truck and it comes to your neighborhood nonsense. In this episode of the Sobadcast, we get into that summertime groove as we discuss the excitement, anticipation, panic and fear of trying to race down the ice cream truck as it jingle-jangled its way through our suburban youth. From climbing trees to triangulate where the truck’s music was coming from, to booking it barefoot down hot asphalt streets, fresh from the pool with a dollar in hand, nothing else mattered but the satisfaction of seeing the ice cream man (or woman) slow down and extend the stop sign off the side of the truck. We meet some interesting characters along the way. Vinnie the Pied Piper who was Bruce Lee-level masterful with the speed of his change belt and remembering every Little Leaguer’s favorite ice cream, to the totally not creepy Mister Softee driver that roamed our neighborhoods and became a staple of our summer youth. Some people will do anything to get Mr. Softee to stop. For our fourth sprinkle-laden episode, we try to recall that single-minded focus to not only catch the ice cream truck, but begging our parents for a simple dollar with which to buy our soft-serve, jimmy cones, toasted almond bars, bomb pops, Marino’s Italian Ices, and yes even black market cherry bombs. But never that Chinese fortune gum. Screw that. What was your favorite ice cream selection? Who was your favorite ice cream man (or woman)? Let us know on Twitter, where we hand out bomb pops every Tuesday at 6. Nothing caused sensory overload quite like an early 80s arcade. The sights, sounds, smells, beeps, bloops and knife fights (real or imagined) kept our 12-year-old selves humming along better than six bowls of Cap’n Crunch ever could. Growing up in suburban Long Island, arcades and video games occupied a very real part of our lives. From standalone arcades like TimeOut! in the nearby Smith Haven Mall, to walls of flashing lights at local roller skating rink, Studio 25, or just a single standalone game at summer hotels and pizza parlors, we grew up amongst a weird world of strange games and stranger gamers. Arcades may have come and gone, but judging by establishments like Williamsburg’s Barcade, they won’t soon be forgotten. Sorry hipsters, we were into it before it was cool. On this, our third episode, we plunk our hard-earned quarters into the podcast to discuss arcades, the Star Wars cantina of adolescent adventure. Special thanks to Andy Hofle for providing the arcade sounds we used at the end of this episode. Don’t forget to follow us on Twitter, where we’ll even let you have next game. Have you ever had the desire to take your slacks and hike them up so high, you nearly started a small fire? Well you, my friend are a slacksjacker. Slacksjacking has been around since the ancient Romans, but you’d be hard-pressed to find any information about it online. Once the lifestyle choice and fashion statement for such entertainment heavyweights such as Ed Wood, Michael Landon, the Bay City Rollers, TV’s Webster and Norman Fell, slacksjacking is now derided and snickered at while searching 1970s male slacks catalogues online. 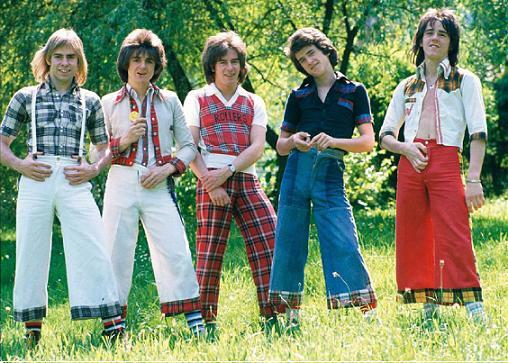 The Bay City Rollers rode the slacksjacking wave of the 70s. For our special 6th annual second episode, we dive deep into the history of slacksjacking, shining a light on incredible-but-true Hollywood stories that show the ugly side of this fashion phenomenon. Don’t forget to follow us on Twitter, where we always keep our pants up to our armpits. Gamera: Super Monster should be so bad it’s mind-blowing. The pieces are there: rubber-suited monsters, bad dubbing, blatant Star Wars and Superman ripoffs, an endless supply of plot holes, ‘special’ effects, space women and a kid running around in brown shorts playing the Gamera theme on an organ whenever convenient. Does it deliver? That’s what we discuss in the first episode of our new podcast, So Bad It’s… (@sobadcast on Twitter), which you can listen to above. Gamera: Super Monster is a bit of a greatest hits mash-up in that the big green, fire-spewing turtle battles all the enemies of his previous films in a series of shoe-horned stock footage clips. They’re sent forth by Zanon, a faceless villain who basically hangs out in space for the entirety of the movie in his Mazda™ Star Destroyer. This movie was apparently an attempt by studio Daiei to forestall bankruptcy (surprise! it didn’t work), hence the massive use of stock footage. According to Wikipedia, only about two minutes of new Gamera footage appears in this thing. What do you think of Gamera: Super Monster, or Gamera movies in general? Let us know in the comments, and be sure to follow us on Twitter. If you want to know more about Gamera and other kaiju films, don’t ask us! You can, however, follow Kyle Yount’s very excellent Kaijucast, where Kyle and his friends tackle a different Gamera and Godzilla-style movie and offer the latest news each month. It’s worth checking out even if you’re a casual fan like us.